Hi, Dean. Thanks for your comment. 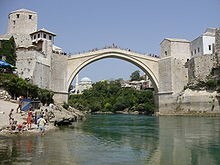 Yes, a traditional arch; I stood on a much lower version of one In Konitsa in Greece, the engineering being the same nevertheless.